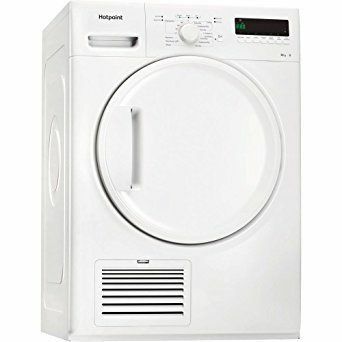 The Hotpoint TDWSF 83B EP Tumble Dryer in white has an 8kg drum that is able to dry up to 24 t-shirts in a single cycle. Sensor drying monitors moisture levels inside the drum so that the machine stops when the clothes reach the drying level selected saving time and energy. The digital display comes equipped with a 24 hour delay timer to begin your drying at a time to suit you. Anti-Tangling technology uses a reverse tumble action that helps to ensure that your clothes dry evenly and without tangling together to keep them looking better for longer. The purse filter has a simple design making it easy to remove and empty without getting covered in fluff.